America's #1 Wood Stove Store. Award winning Furniture Store, too! Nothing beats the heating "throw" of a good coal stove. The higher heat in every pound of coal and the long lasting burn times, make coal stoves the choice for battling cold winters. We offer USA made choice coal stoves from Legacy Stoves and Hitzer. Check them out to see if this choice is right for your needs. 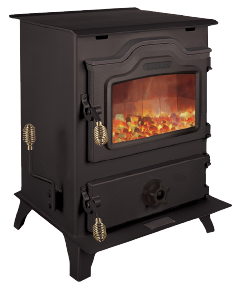 The Mark III Coal Stove is sophisticated, yet powerful enough to heat most homes. The body is robotically formed and welded from a single piece of ¼-inch steel. A blower system and specially designed baffle circulate heat throughout your home, not up the chimney. Reduce your utility costs even more with an optional stainless steel residential hot water coil. throughout your home, not up the chimney.